At 2 p.m. today, the Ducks will play in the 101st Rose Bowl game against the Florida State Seminoles. “The Granddaddy Of Them All” has multiple storylines this year: a matchup of Heisman winners in Jameis Winston and Marcus Mariota, traditional powerhouse Florida State facing off against the modern day power Oregon, east coast vs west coast, the come-from-behind Seminoles and the dominating Ducks — this game has it all. Oregon comes into the game as arguably the hottest team in the nation, outscoring opponents 247-85 over the last five games. To bookend that stretch, the Ducks beat Stanford for the first time in Mariota’s career and avenged their earlier loss by beating Arizona in the Pac-12 championship game. Florida State on the other hand has outscored its opponents 145-117 over their last five games, with its last four wins coming by a combined 14 points. But a win’s a win, and Florida State hasn’t won 29 consecutive games by accident. FSU has been the comeback kid all season, so the Ducks will have to continuously operate at full efficiency in order to stay ahead on the scoreboard. Royce Freeman ran 19 times for 98 yards against Stanford. Something that will help the Ducks maintain a lead, if they are to get one, is an effective running game. Of course the Heisman-winning quarterback will likely be the catalyst for the Oregon attack, but running the ball will help keep the Florida State defense honest and keep pressure off Mariota. It’s no secret that the Ducks are at their best when they can run the ball effectively. In fact, Oregon hasn’t lost a game under Mark Helfrich when the Ducks rush for more than 200 yards. They’ve gone a perfect 19-0 during his tenure. 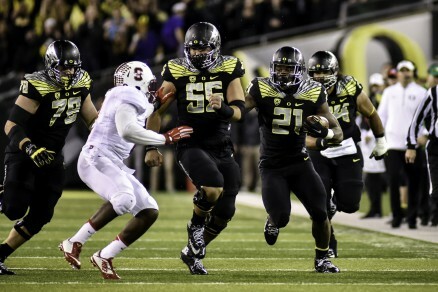 In their rematch against Stanford, the Ducks rushed for 267 yards against the No. 2 ranked Cardinal defense. Royce Freeman went for 98 yards on 19 carries, with Mariota rushing for 85 yards on nine carries and two scores. Add Thomas Tyner‘s 63 yards and two scores, and the Ducks backfield was borderline unstoppable. If Tyner can play in the Rose Bowl, and it looks like he should be able to, he will add needed depth and a physical presence to an already talented Oregon backfield. 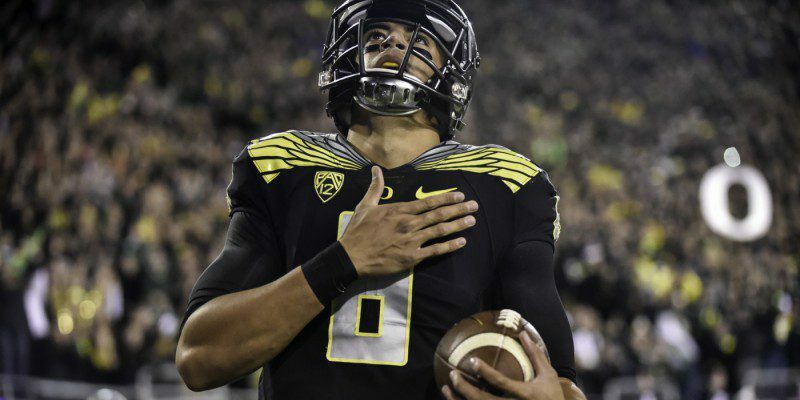 Marcus Mariota ran for two scores against Arizona in the Pac-12 title game. The last time the Ducks took the field they put up 51 points against Arizona. In that game, they rushed for 301 yards on 54 carries. That is their formula for success. A consistent running game will force Florida State to respect not only the run, but also the play action, something Mariota and the Ducks do very well. If Oregon can get the read option established and get both Mariota and Freeman gaining big yardage early, wide receivers should be able to find the wholes in the defense for chunk plays down-field. The Ducks rush for 200 yards, they win; that’s what recent history has shown us anyways. Watch for Oregon to run the ball early and often to get the play action pass game going. Mariota will be the key for the Ducks offensively, but the total team rushing yards could be the difference in the game. Can the Ducks hit their magic number? We’ll find out today.